Remember when Krusty used to be funny? Now I cringe whenever he comes on screen (this also applies to every other character). 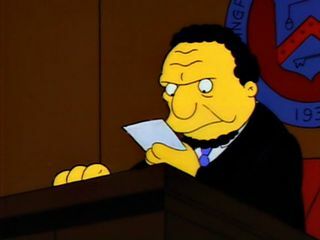 This verdict is written on a cocktail napkin! And it still says guilty! And guilty is spelled wrong! "I move for a bad court thingy!" "Yeah! That's why you're the judge and I'm the... law... talkin' guy." As of this moment, Lionel Hutz no longer exists. Say hello to Miguel Sanchez! Now remember, if anything happens, let's not get the law involved. One hand washes the other - Oh, that reminds me. Oh boy, liver! Iron helps us play! When I first saw this post I thought it said Poochie. "Note: Poochie died on the way back to his home planet." "According to the gas chromatograph, the secret ingredient is ... LOVE!? Who's been screwing with this thing!?" "The only thing I'm high on is love... love for my son and daughters. Yes, a little LSD is all I need." Are you still here? Boy, you are slow. Hello, Mr. ... Kurns. Me Bad want money now. Me sick. Homer: Oh, I have 3 kids and no money. Why can't I have no kids and 3 money!? Ooooh, he card read good! "So pick, please me, Mr Burns..."
So over the weekend I was arguing with Calorie Mate that The Jockey's episode was the last great Simpsons episode. To which he argued that it is not in fact a great episode. Is this a commonly held belief? What hurt you people so? That's the one that's intentionally filled with things that Internet fans hate right? The idea is pretty funny but it's a total tedious bore to watch. It's awful. Absurd premise, weird pacing, goes totally off the rails. It does have the line "if he doesn't win we're going to the glue factory... And he won't get to come" though, which is something. Yeah, it's truly a terrible episode. Started decently enough, but the whole Jockey Elves thing was cringingly stupid to the point of embarrassment. Who is playing with the London Symphony Orchestra? Come on people, somebody ordered the London Symphony Orchestra... possibly while high. Cypress Hill, I'm looking in your direction. Jefferson Airplane paved the way for Jefferson Starship which set the stage for the Alan Parsons Project. Which I believe was a hovercraft. Before we start, we have a lost child here. If she is not claimed in the next hour, she will become the property of Blockbuster Entertainment. I'm pretty sure this is part of an exchange between Homer and Lisa at he dinner table, but other than that I can't really offer any context clues. 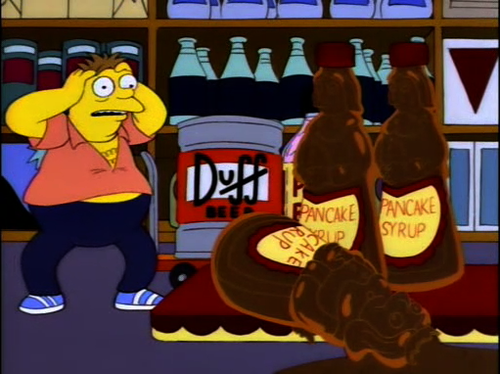 I just remember Homer saying something along the lines of "what does it get ya? Nothing! Who cares?! Nobody!" I believe that's from "Bart Gets Famous." Lisa: I've got a weekend job helping the poor and I'm only eight. Homer: That's not a job, it's a waste of time. What can poor people pay you? Nothing! What satisfaction do you get from helping them? None! Who wants to help poor people anyway? Nobody! This thread has uncovered one of my secret powers: an almost eidetic recall of Simpsons quotes and an urge to correct others. Grand Funk paved the way for Jefferson Airplane, which cleared the way for Jefferson Starship. The stage was now set for the Alan Parsons Project, which I believe was some sort of hovercraft. Moses is back! Quick, everyone look busy! 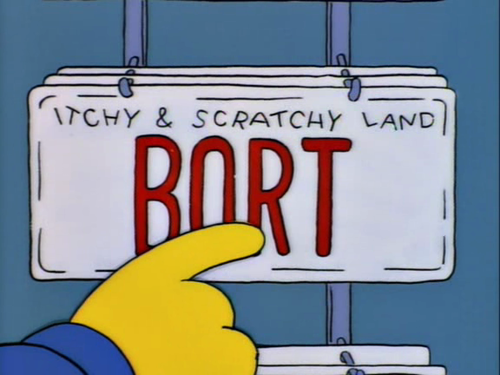 "BORT" is my standard moniker for any RPG character I can't think of a name for. "Well you can't possibly like Maggie best. What's she ever done? Nothin' for nobody!" "Excuse me, ma'am, where are the lampshades? ... Ma'am?" "Oh no ... I've killed her! ... IT'S ALL HAPPENING AGAIN!"